I have been to fort Visapur number if times .. but this time incident of 3 of our new boys missing in fog and rain made it unforgettable experience indeed !! !As I have said many times Sahyadris are as easy to ride as easy to get lost !! Ways on the forts are very much confusing and acts like a maze once u loose directions .. and mist .. fog .. clouds and rain makes the situation worse ,… your visibility gets impacted seriously .. u will not be able to look beyond few feets though !! Regular trek members started descending in group but these three young chaps who thought of waiting for some time under tree shelter realized that they are left behind and called me up on mobile !! Luckily mobiles were working …. myself and Abhishek immediately started back travel to pick boys up .. and clouds & heavy rain helped us to get lost !!! yes .. we were lost !! I was so much surprised ! having experience of over 25 years of trekking and can not find a place !! ohh god … we called up boys to wait for us .. and could get the place where we took our lunch after about 45 minutes !! After 20 minutes Makrand and his friends arrived and we started our back journey … This time we thought that way back is simple and again got lost !! after 45 minutes of walk we came back to square !! Finally I took judgement and my 6th sense said a way to choose from .. we started that way and got descend location in 5 minutes . and to our surprise the rain suddenly stopped !! it was like someone was trying to make us misguided !! After that it was just simple descend .. no issues .. we were able to catch 5.30 pm train back to pune ..
Do not leave your group, keep eye on what the trek leader is instructing you. Look at her energy levels .. just need chance to jump on ..
Ab group phots to bante hai na yaar ! 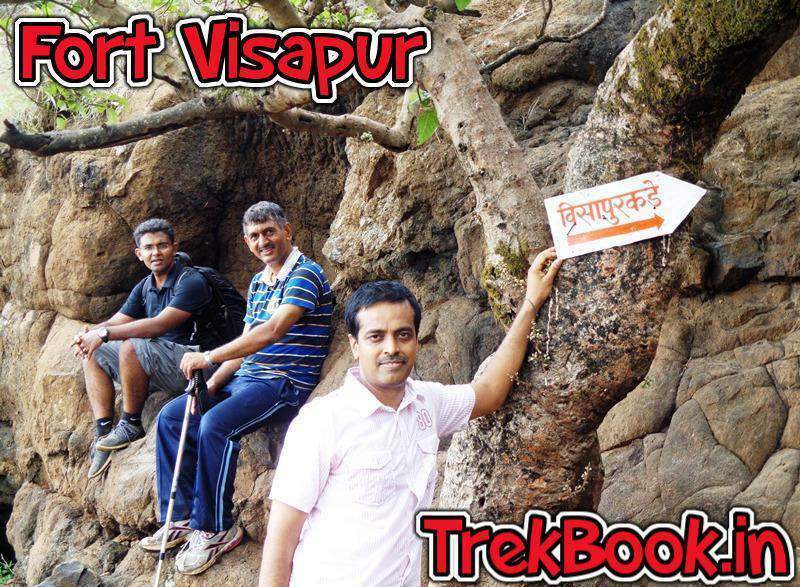 Summit Fort Visapur !! This spot will be worth re visiting during monsoon season !! Climbing On The Rocks !! Fashion photography even on fort !! Fort Visapur is larger and higher in elevation than fort Lohagad, Due to which, the British troops in 1818 AD set up their canons on Visapur and bombarded Lohagarh, forcing the Marathas to leave the fort Lohagad. Medium difficulty, however WARNING is that without proper local guide or experience trekker in group do not attempt climbing this fort, every year at least 3~4 cases of trekkers being lost in forest are reported.